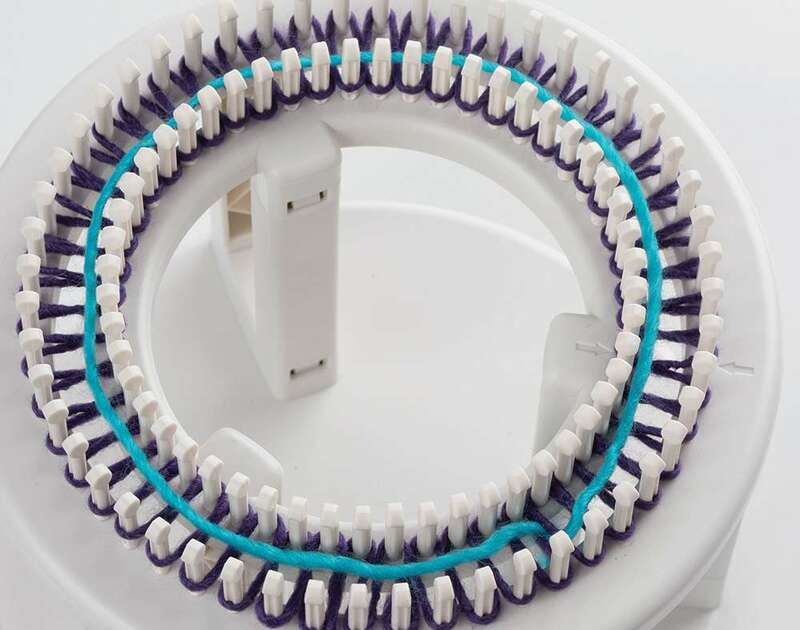 We have received many requests for how-to instructions and videos for the ‘rotating’ Double Knit Loom. Videos are in the works… stay tuned for those. There are detailed instructions that come with the loom, but we will provide here as well. In this venue, we have the ability to make photos bigger, which can be really helpful. Also if you have questions about the process or the loom, you can ask in comments and get an answer quickly. 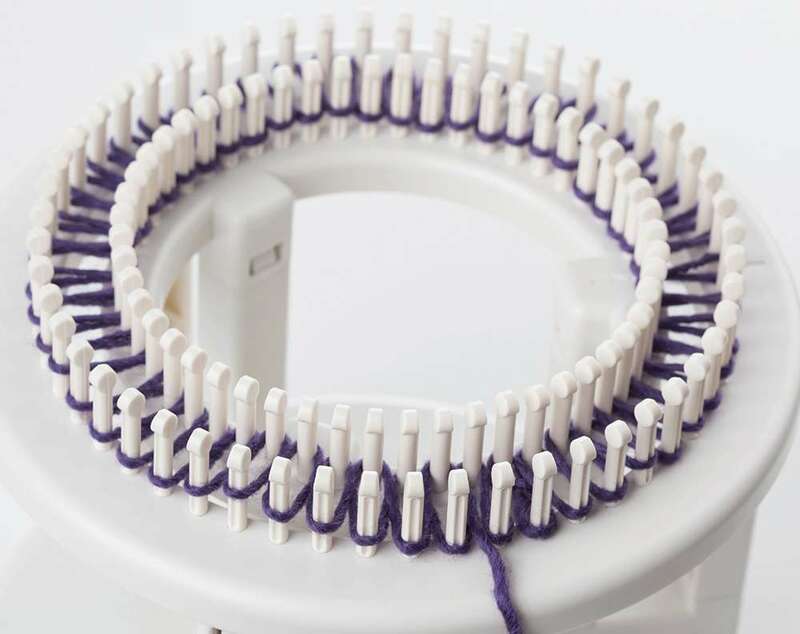 The process of knitting double knit ‘in the round’ is a bit different from double knitting on a straight loom or knitting board. Actually the movement/ process is much easier…. no turning the loom to other side. You simply knit continuous in one direction around the loom. 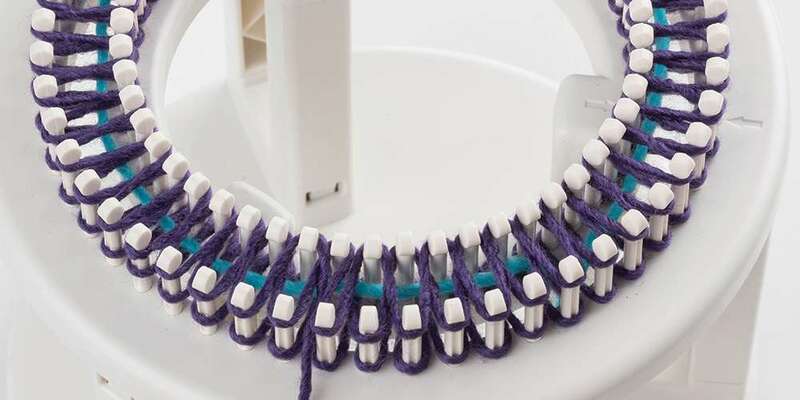 Simply rotate the loom as you weave, and hook over stitches; your knitting location stays in one spot. 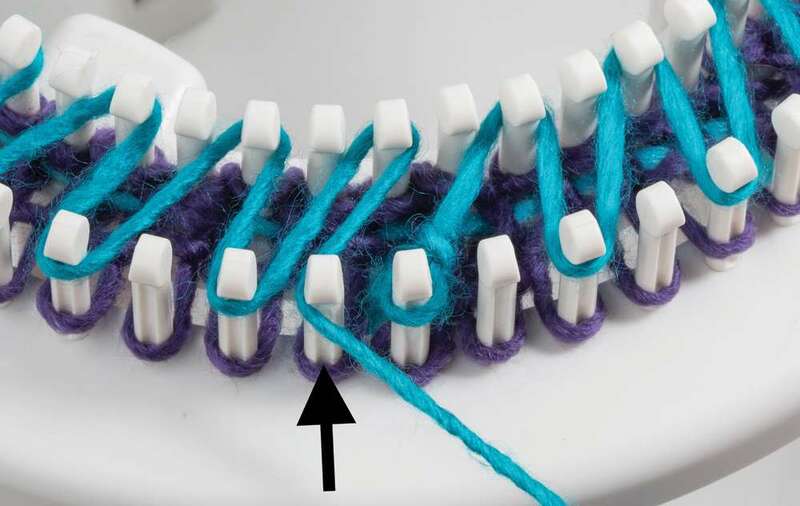 In double knitting, you are using 2 pegs as one stitch, one peg on the outer loom, and the peg directly across on the inner loom (stockinette). 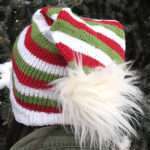 After lots of testing, we found 52 stitches to be the ideal amount of stitches for an adult size hat. IMPORTANT: First thing, make sure the arrows on the inner loom and the outer loom line up. They are there so the peg spacing is in correct position. 1. To begin, start with a loop knot and put on the first peg on outer loom. You can mark this peg with a stitch marker, or use the outer arrow. Wrap the next peg on inner loom, to the R of arrow on inner loom. Wrap ‘every other’ peg, alternating from outer to inner loom. Keep going around the loom with same weaving, like above. 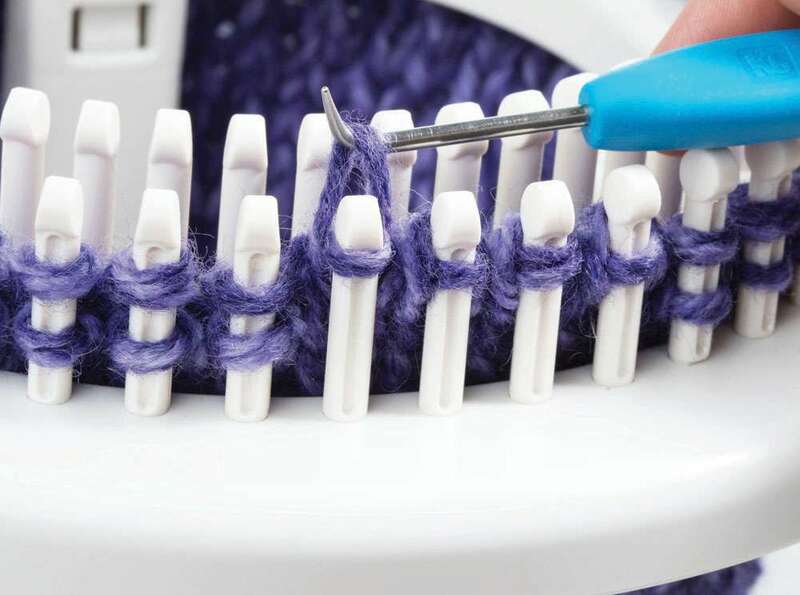 When you reach the starting peg, wrap the adjacent peg (to left of starting peg) on the outer loom. Two pegs will be wrapped consecutively. 2. Then continue around the loom again in the same, ‘every other’ wrapping pattern. 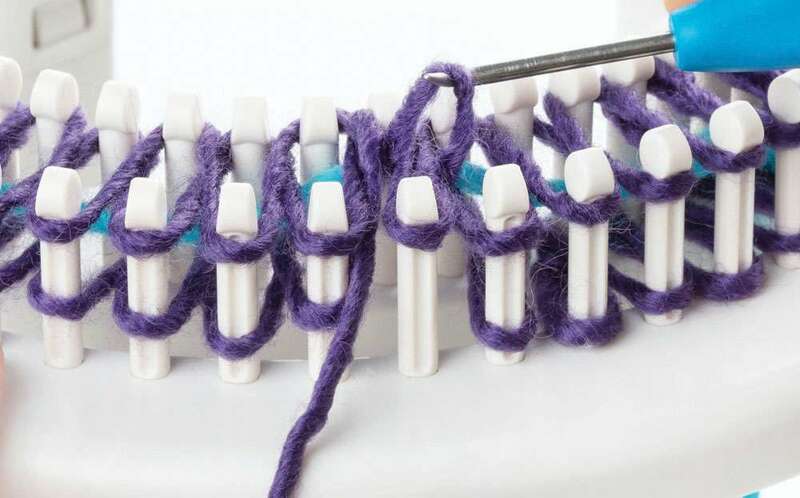 (Working the 2 consecutive pegs adjusts your weaving, so that now, you will wrap pegs skipped in the first time around loom). Make sure, after working around loom (2 times), all pegs have one wrap. As you work, allow the loom to turn-no need to move the loom. 3. Now cut a piece of yarn approx. 35 inches long. 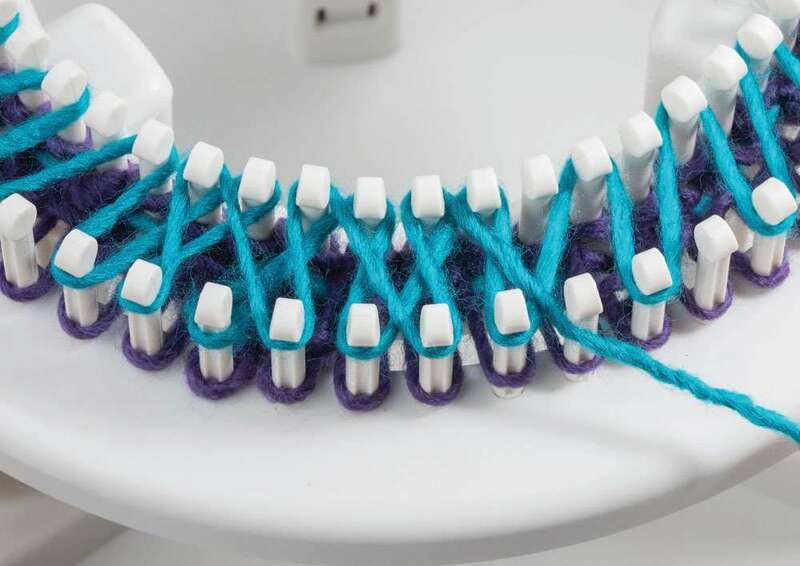 Lay across stitches and around the loom between the inner and outer loom pegs (blue yarn) . 4. Repeat steps 1 and 2. Wrap around the loom two times again, putting a second wrap on all pegs. Now, all pegs will have 2 wraps. 5. Hook over the bottom loop over the top loop on all pegs. Do this on both sides of the loom (front of the outer loom and back of the inner loom). Push sts down from top of loom after the row is hooked over. Now the stitches are cast on. From the cast on row, continue in any stitch pattern. Stitches may seem to be loose for first few rows, but they will even up after you get further along in the knitting. This stitch is worked with the same process as Stockinette Cast On. It creates a smooth even knit pattern. Weave front to back, wrap the outer loom peg and then wrap the inner loom peg in same pattern as with stockinette cast on, skipping “every other’ peg. Wrap 2 times around the loom. 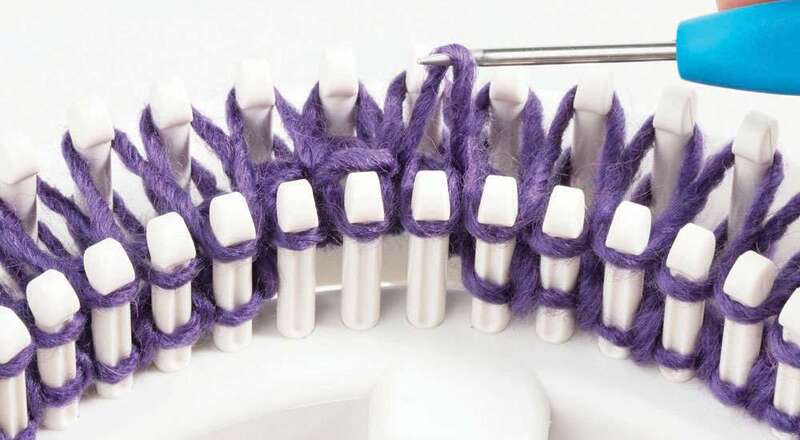 Then with knit hook, take bottom loop over the top loop on each peg. Simple repeat the above to create knit as long as desired. This is a great stitch for hat brims, cowls or scarves. 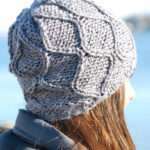 This stitch is similar to the stockinette, except it’s done at an angle. Work with even number of stitches. Start from the starting peg on outer loom and wrap to the 3rd peg to R on the inner loom. Wrap that peg, and then back to the outer loom, keeping the ‘every other’ peg pattern. Wrap this peg. This creates the angle for the ribbing stitch. Continue around the loom, maintaining the angle with ‘every other’ peg, until you get to peg opposite the starting peg. Wrap this peg, the peg on outer loom to left of starting peg (black arrow). 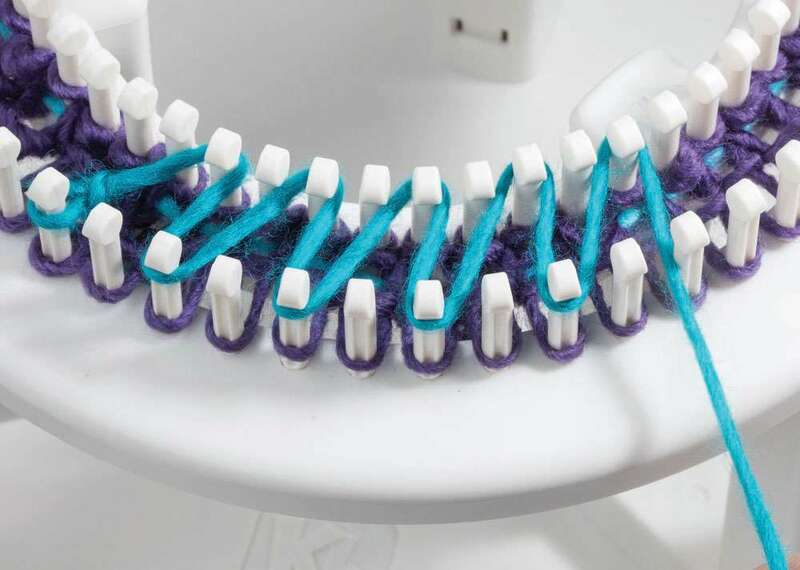 This creates 2 pegs wrapped consecutively on the outer loom. Do not wrap the starting peg. Now change angle and wrap the empty peg (black arrow) directly across on the inner loom. Hook over all pegs from outer loom, and then on inner loom. Push stitches down and continue steps for ribbing rows. Move the stitches from inner loom to the outer loom. Then with 2 loops on each peg on the outer loom, hook over the bottom loop over the top loop. Cut the working yarn coming from the hat, leaving 16-20” tail for the gathering process. Take a darning needle and thread yarn tail. Use the yarn tail to hold the stitches. 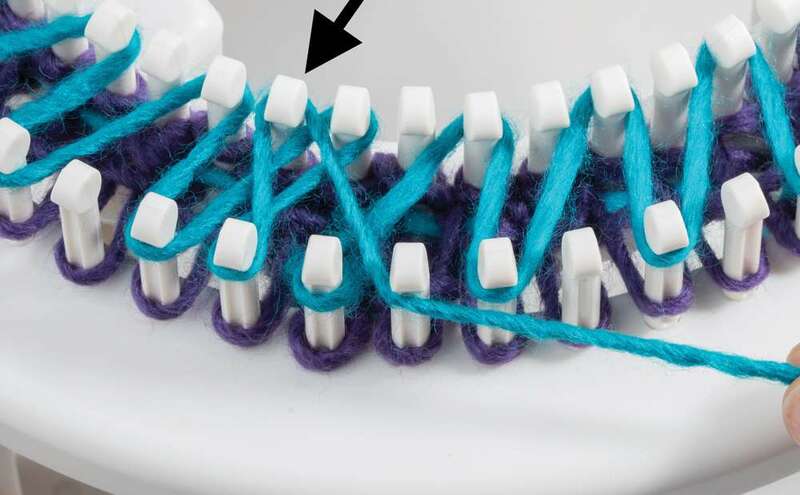 Remove the stitches from the first 2 pegs, then skip next 2 pegs, remove the stitches from the next two pegs and place on yarn tail. 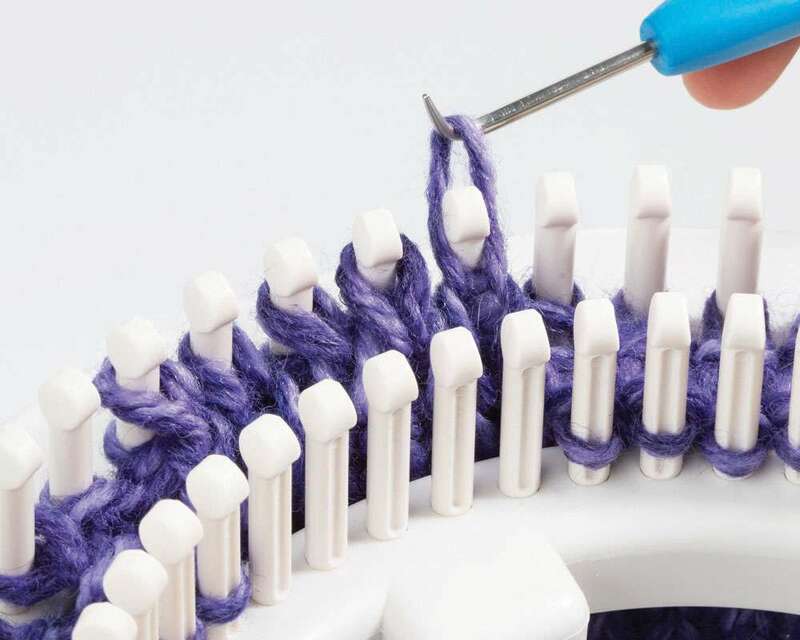 Continue process of skipping 2 pegs and picking up 2 stitches until you reach the end of the round. Next, go around the loom again removing the remaining stitches. Cinch the top closed. Weave ends in. Hi Anne, We have your note and so sorry for sending the wrong product. We will have the Premium Round Looms off to you tomorrow along with a prepaid label to return the rotating loom. Thanks for your patience. I wish the pictures showed the arrows so I could determine if the yarn is in the right place after the end of the round. My yarn end never is back by the arrw. 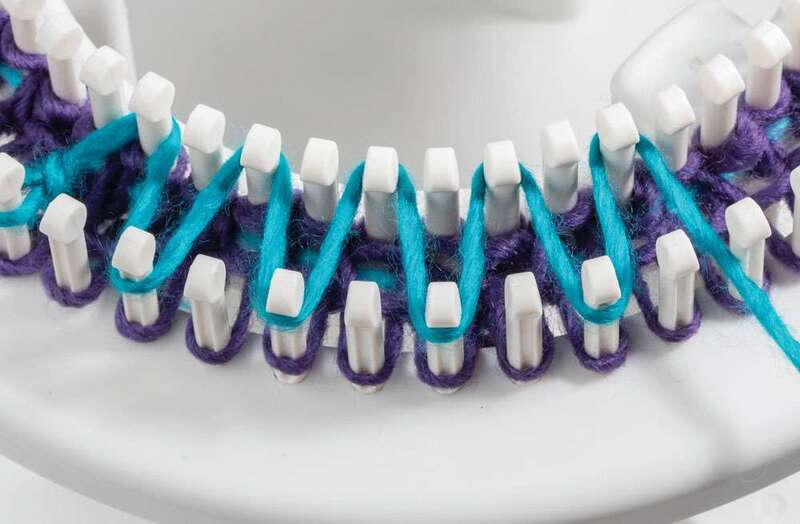 Love the way this operates but I rarely double knit. It’s a whole new challenge for me. When I finished my stockinette cast on, I started my row one stitch to the left of the arrow on the loom. Not what I planned. I knit a few rows of stockinette to get the feel of the loom. I found that at the end of each row, I was ending up one more stitch over to the left. Clearly, I’m placing my working yarn in the wrong spot. Can anyone help? Hi Melissa, What you are doing is OK and the starting peg will continue to move to the left. 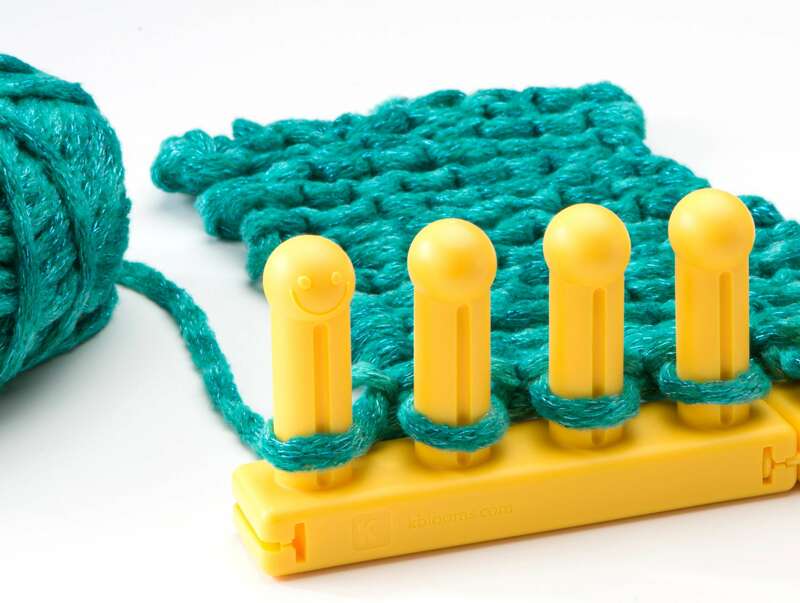 What we have found is if you move the yarn over to the same starting peg with each row, it will be a more even knit. 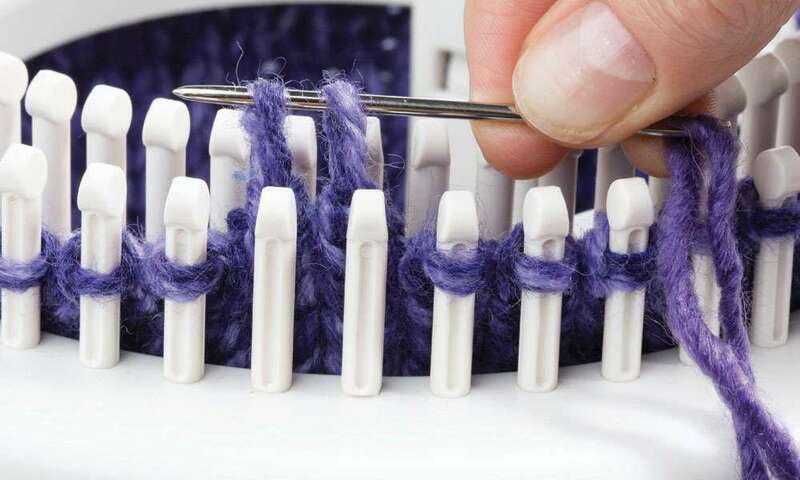 It looks like you are skipping a peg when you start a row, but it will come out good and not leave any holes. Just be sure all pegs get wrapped as you return to starting point. Could you please tell us when we will be able to see videos on how to use this loom? I think I have it figured out but it would be nice to see someone doing it to be sure it is all right. What size hats the this loom make. Does it make baby hats? It makes adult size hats. Videos will be available by the end of September, beginning of October.